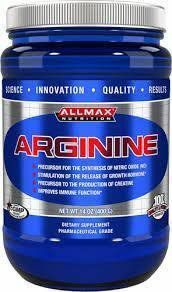 Recent University level research confirms Arginine's ability to act as a natural precursor to Creatine synthesis in the body. It has also been shown to increase the body's ability to consume and utilize oxygen, primarily due to its ability to increase levels of Nitric Oxide (increase Vasodilatation). 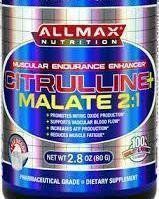 ALLMAX Citrulline Malate [2:1] is a premium pharmaceutical grade (USP) with 2 L-Citrulline amino acids bound to 1 Malate. Aside from assisting with delivery and absorption, the Malate has a critical function in the TCA (or Krebs) cycle that produces energy within the mitochondria. 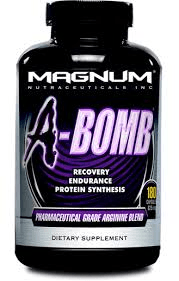 Specific research suggests a 34% increase in the rate of oxidative ATP, 20% increase in post-exercise phosphocreatine recovery and significant reduction in the sensation of fatigue. Stack with Atro-Phex, Cellmass, N.O.-Xplode, Axis-HT, Syntha-6, and Truemass for maximum physique and performance impact. †When combined with regular exercise, N.O. Xplode and Cellmass. Directions for Persons Under 200 lbs: As a dietary supplement, take 3 tablets 3 times per day, consumed several hours apart, everyday. Take on an empty stomach. Directions for Persons Over 200 lbs: As a dietary supplement, take 4 tablets 3 times per day, consumed several hours apart, everyday. Take on an empty stomach. Note: Do not take glutamine supplements and Nitrix at the same time as doing so may diminish its effects. Keep intake of glutamine supplements to 10 g or less of glutamine daily. To maximize the vaso-muscular volumizing effects take Nitrix 3 time per day, every day. Also consume 120 oz of water per day and a diet that is rich in protein and carbohydrates. Your body chemistry and weight will determine how long it takes to experience the effects of Nitrix. Many users may notice the effects within the first 7-14 days of recommended use. Each week thereafter, the effects will become more pronounced. Other users may notice the initial effects after 14-21 days of use. Again, the effects will become more pronounced each week thereafter. 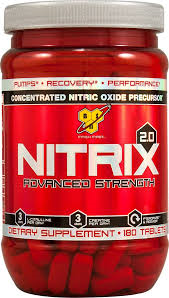 Nitrix begins to induce its maximum vaso-muscular volumizing effects in weeks 3-12. After 12 weeks of use, discontinue for at least 4 weeks. dense muscle, your strength will shoot through the roof and you won’t crash hard — ever! it’s simple. Detailed scientific research and real world testing on some of the freakiest mass monsters on the planet. This insane formula wasn’t tested on lab rats, soccer players or fitness enthusiasts. 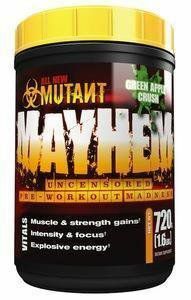 MAYHEM is for Mutants only! freakin’ buy – guaranteed. But be warned, the MAYHEM madness experience can be addicting and you will have to exercise extreme self-when taking it! Enjoy the ride.